As Viggo Mortensen’s character Ben Cash explains to one of his daughters, be specific on why you like something, instead of using the word fantastic. 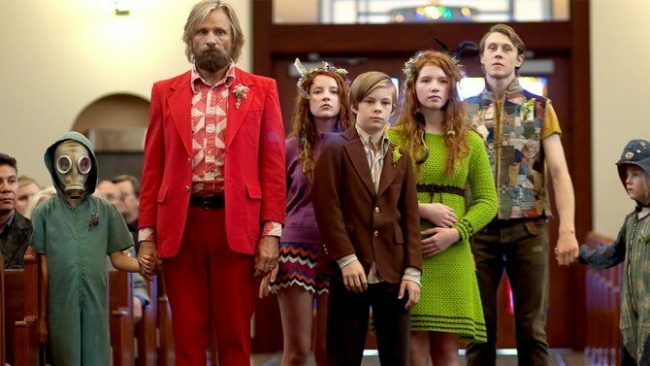 Captain Fantastic is one of the best films of the year, and now I attempt to explain why. If you like the idea of living life “off the grid,” then you’re going to enjoy director Matt Ross’s newest film. 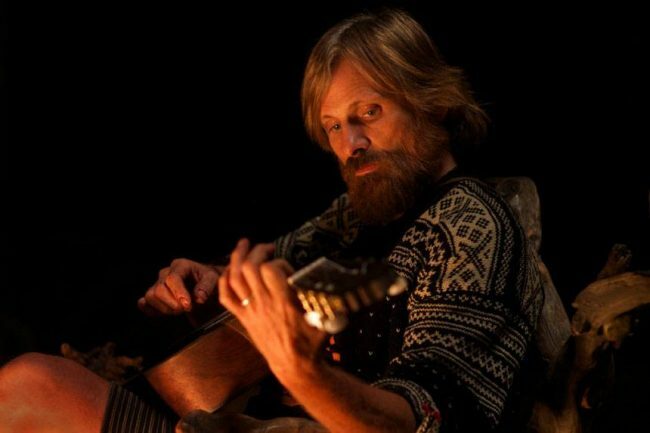 There is no other actor in my cinematic world that will captivate me as much as Viggo Mortensen. He’s truly one of the finest character actors on the planet. If you’ve enjoyed Mortensen’s previous work, then you will not be disappointed in his performance in Captain Fantastic. He stars in this family drama about a left-wing survivalist father who raises six kids in the deep wilderness of the Pacific Northwest. Ben sort of reminds me of Harrison Ford’s Allie Fox in 1986’s Mosquito Coast. His wife, played in flashbacks by Trin Miller, has committed suicide in a mental institution. 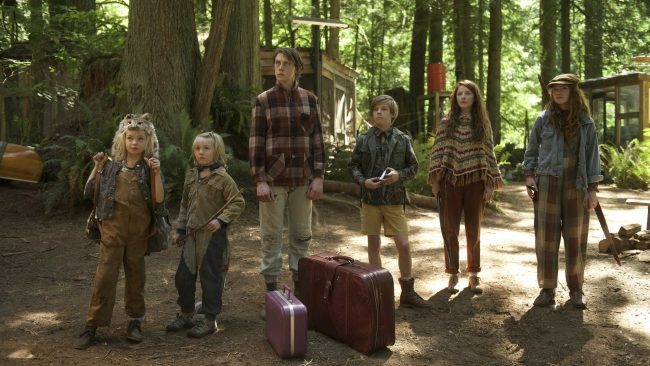 Ben has to make a decision of packing up his brood so they can attend the funeral, or stay put in the forest to avoid any unnecessary and potentially devastating family drama. The father-in-law Jack, played by Frank Langella, not only blames Ben for his daughter’s death, but also threatens to take the kids away. However, what’s surprising is that those kids are not only self-sufficient but well educated on literature, philosophy, and the ailments of our corporate controlled society. There is humour when you hear a six-year-old explain the subtle nuances of the US Charter of Rights. Ben and the kids decide to attend the funeral because “fight the power, stick it to the man” is the driving force behind this little family’s motivation. In their minds they’re on a mission to rescue their mother from a regular Christian burial, so that they could have her cremated per her Buddhist request that was clearly stated in the will. Of course, when they arrive at the funeral all hell breaks loose and the unity of this Swiss Family Robinson-esque family is tested as it starts to rip at the seams. Ben is faced with a dilemma and has to make a decision on their future. His eldest son, Bodevan (George MacKay), has been secretly applying for Ivy League schools, and although he can kill and skin a deer with a knife, he’s awkward and a tad overzealous when it comes to the ladies. MacKay’s performance as the genius older sibling, who is also so terribly socially inept, is one of the film’s prime examples of why maybe raising kids in solitude or cut off from the outside world may not be the best idea. He absolutely nails this role and I’m excited to see if this performance propels him to bigger things down the road. All the kids might be able to discuss quantum theory, but when they are surrounded by the niceties of modern life, they sit and watch in utter amazement and probably horror, as their cousins who are around the same age play violent video games and celebrate the joys of overly commercialized Christmas. There are some nice parallels between the Cash kids and their “wired” cousins who are plugged in, over stimulated, and, in some sense, “dumb’ed down” by our ugly modern culture. This film is gorgeous to look at, it’s beautifully acted, and director Matt Ross takes us on an emotionally charged journey from the outskirts of civilization to the emotional turmoil that is found within each character. Although the kids are raised to be intelligent, and extremely fit, the limits and dangers to Ben’s methodology start to rear its ugly head. The story is beautifully crafted, and although the third act sputters a little bit, you become emotionally invested in this family as they travel to New Mexico in the bus so aptly named Steve. You can’t help but cheer for these little anti-establishment hippies, because even if their views might include a few tinfoil hats, there is something alluring about living off the land, celebrating Noam Chomsky Day and telling kids blunt truth about the world around them. Captain Fantastic is that rare kind of film that makes you question and maybe refine personal values. It’s a compelling and, at times, heart wrenching story where it invites the audience to consider whether Ben Cash is right or wrong in how he chooses to live his life and raises his kids. There might be something romantic about the way he wants his children to become philosopher kings, but what are the consequences? So far this is one of my favorite films of 2016, and will definitely be on a few top 10 lists at the end of the year. It reminds me of last year’s Infinitely Polar Bear, in that it was released before the Oscar award season, and unfortunately what happens is sometimes these amazing little film gems are forgotten or get lost in the shuffle when we are inundated with other stories being positioned for golden statues in the fall. This one deserves to be remembered. It’s one of Mortensen’s finest performances alongside a message that is relevant in today’s world. Giving Captain Fantastic five stars. One of the best films of 2016. This is on limited release on the following dates. Check your local listings to find the theatre it’s playing at.